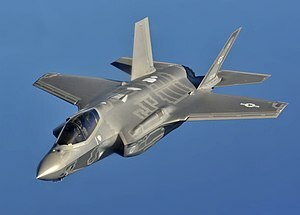 لاکهید مارتین اف-۳۵ لایتنینگ ۲ (اینگیلیسجه: Lockheed Martin F-35 Lightning II) بیر ساواش طیاره‌سی‌دیر.بو طیاره‌نی آمریکا دۆزلدیب، فایدالانیر. ↑ Story, Courtesy (31 July 2015). "U.S. Marines Corps declares the F-35B operational". www.marines.mil (Headquarters Marine Corps). Retrieved 31 July 2015. ↑ Reed Business Information Limited. US Marines stick to F-35B dates despite new problems. flightglobal.com. یوْخلانیلیب25 May 2015. ↑ F-35B on track for operational readiness despite software challenges. janes.com. آرشیولنیب اصلی نۆسخه‌دن on 29 April 2015. یوْخلانیلیب25 May 2015. ↑ "U.S. Air Force eyes future F-35 engine and arms upgrades". Reuters. 7 April 2015. Retrieved 25 May 2015. ↑ The Current Status of the F-35, in Three Charts. Intercepts – Defense News. ↑ Error on call to Şablon:cite web: Parameters archiveurl and archivedate must be both specified or both omittedPentagon And Lockheed Martin Deliver 300th F-35 Aircraft. آرشیولنیب اصلی نۆسخه‌دن on 11 June 2018. یوْخلانیلیب11 June 2018. ↑ F-35 Lightning II Program Fact Sheet Selected Acquisition Report (SAR) 2015 Cost Data (24 March 2016). ↑ ۸٫۰ ۸٫۱ ۸٫۲ Agreement Reached on Lowest Priced F-35s in Program History. F-35 Lightning II. یوْخلانیلیب3 February 2017. بۇ صفحه‌‌ سوْن دفعه ‏۲۶ ژوئن ۲۰۱۸، ‏۱۶:۵۶ تاریخینده دَییشدیریلمیشدیر.